Sarasota, Florida has plenty of soft, white sand beaches, an eclectic art scene, delicious dining, and plenty of “on the water” outdoor activities. Yet, what many people don’t realize is the natural wilderness that is nestled into this charming city. The Red Bug Slough Preserve, located at 5200 Beneva Road is a spectacular find for those who enjoy the outdoors. This 72 acre preserve is literally “right in your backyard” and it is a location that you’ve probably passed driving down Beneva Road to the mall. After driving by this place so many times (and being a wildlife enthusiast), I decided that it might be worth checking out. As you turn into the parking lot you will notice a playground and picnic tables at the front entrance and off to the right are the restrooms. As you go past the fence and toward the trail, there is a map with information as to the types of animals that you may see during your hike. These animals include: birds, squirrels, river otters, turtles, and alligators. 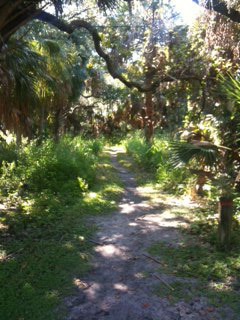 The moment you step foot onto the trail you become surrounded by trees, plant life, and other vegetation. The trails aren’t as clearly marked as say Oscar Scherer or Myakka, but navigating is still pretty simple. Within seconds your ears begin hearing the birds in the trees and the squirrels rustling in the leaves and pine needles. You’ll spot many of the small geckos on the path in front of you, as well as dozens of dragon flies. Continuing onward, you should stay on the traveled paths and use the posts with the red markers for guidance (the last thing you want to do is make your own path and walk straight into a bee hive). My hike began around 10 AM. After walking for 15 minutes or so, I stumbled upon the swamp. The very first animal that I spotted was a bald eagle that landed on a tall, dead tree across the swamp. After a few minutes of taking photographs of this gigantic bird, I began to hear splashes in the water. As I shifted my attention to the water there were three river otters swimming and chasing the ducks. I probably watched this for at least ten minutes. After the otters tired out, I walked to an open prairie along the swamp and stumbled upon a fishing pier where I stood and took in the amazing views of the nature around me. The Red Bug Slough preserve has something for everyone. Whether you are taking the kids to the playground, walking your dog, riding your bike, photographing nature, go fishing, or just want to do some exercising outdoors, this is a place where you can do it all. Now, the one downside to being so close to home is that you do in fact see homes can hear the traffic in some spots as you hike. However, that doesn’t seem to affect the wildlife in this preserve, nor will it affect the great time you’ll have. The Red Bug Slough Preserve is a free amenity to those who reside in Sarasota, Florida. Being so close to everything, you could be at Red Bug Slough and in 10-15 minutes be at the beach. 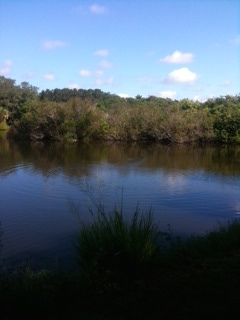 Enjoy the Red Bug Slough Preserve and make Sarasota your new home.